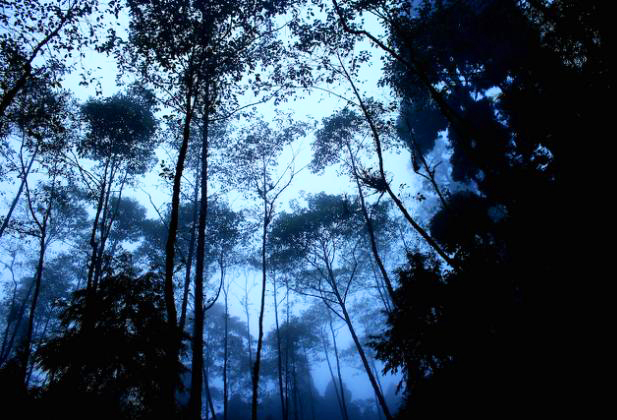 You must have heard of the Grand Canyon, the Galapagos Islands, and Venezuela’s Angel Falls; you’ve probably even heard of more obscure natural wonders such as the needle-like rock forests at Tsingy de Bemaraha. But no matter how much of the Earth we cover, there’s always something breathtaking just around the bend. Today we have come up with a list of some of the most ambiguous oddities in the world, totally unheard of, that are sure to take your breath away. Sit tight, folks, as you are about to step into a world that you take will leave you with awe as you make the progress. 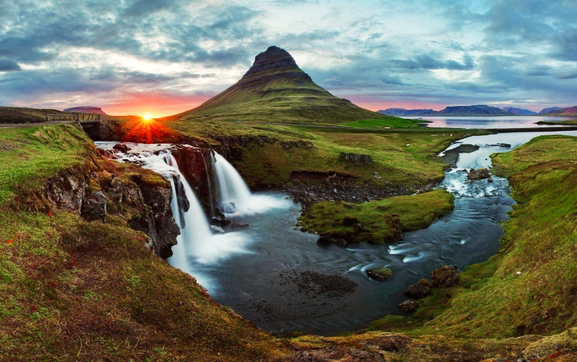 Iceland is home to some of the most exquisite natural marvels from around the world, and the Kirkjufell Mountain fits perfectly into this category. Best known for stunning pictures brought back by tourists, Kirkjufell is a photogenic mountain with three picturesque waterfalls running into a crystal clear stream at the mountain’s foot. Shapes into a perfect portrait of idyllic Iceland; the Krikjufell Mountain also plays its part as one of the best places to view the heavenly Northern Lights. 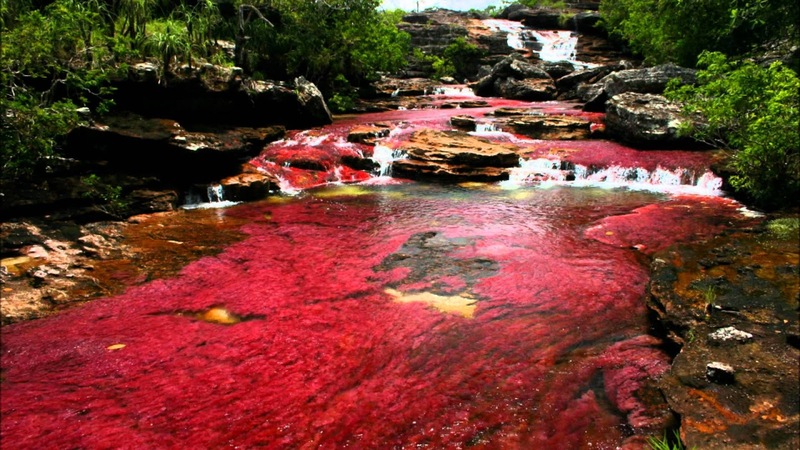 Not known to many, the Cano Cristales, tucked neatly away in the mountains of Colombia, is a gem of a river popular among the locals as the “River of Five Colors”. Only accessible by airplanes, you would want to visit this natural oddity during summers when the heat brings out the most vibrant shades of red. The colors of the river water come from a combination of algae, the natural hue of river rocks and of course, the blue of the water itself. Interested in seeing some of the oldest rocks in the world, as well? The Guiana Shield within the Cano Cristales (about 1.2 billion years old) will fulfill this desire of yours. 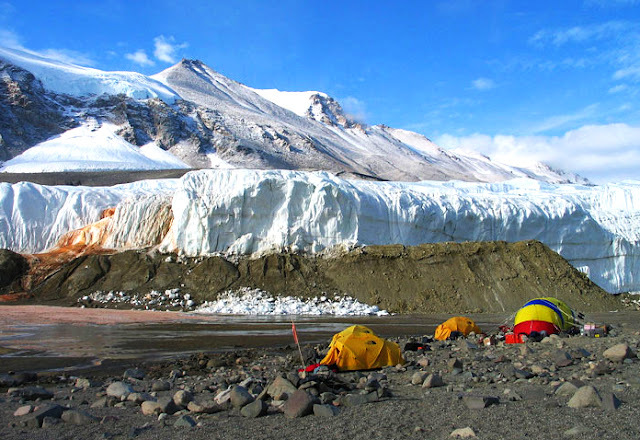 The Antarctic Taylor Glacier vomits a continuous stream of iron-rich hyper saline water onto the surrounding snow. The glacier was discovered in 1911 by an explorer named Thomas Griffith Taylor, who surmised that the reddish tint was caused by an unknown form of bacteria. It wasn’t until much later that we found the real reason for the spring of blood-colored water—an ancient underground pool of saltwater about 400 meters (1,300 ft) below the surface of the ice. The iron-rich water squeezes its way up through a fissure to the surface and comes in contact with oxygen for the first time, the iron hydroxide reacts instantly, giving us a waterfall of rust—the Blood Falls. Beppu, Japan is one of the world’s hot spring hot spots; there are more than 2,500 springs in the area—the second largest such cluster in the world. 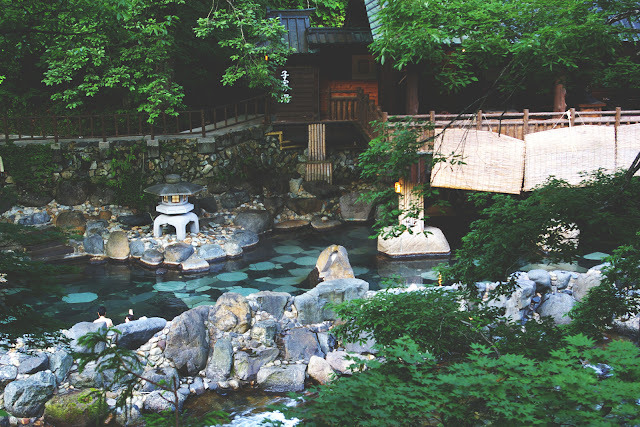 The springs are colloquially known as the “Eight Hells,” since there are eight main areas, each producing a unique type of spring. 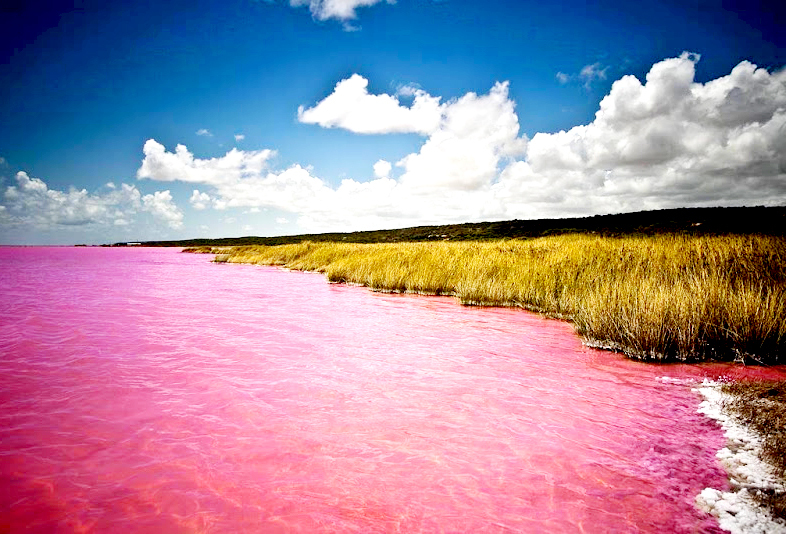 Blood Pond Hell, pictured above, is saturated with iron, giving both the water and the steam a dark reddish tint. Some of the other Hells include Demon Mountain Hell, which houses about 80 crocodiles; White Pond Hell, which contains boric acid that gives the water a milky consistency; and Oniishi Shaven Head Hell, which is a mass of bubbling mud that—supposedly—resembles the shaven heads of monks rising to the surface. The Okanagan Valley lies at the extreme southern border of British Columbia. For thousands of years, aboriginal tribes have lived and battled in the valley, and their legends remain to this day. One of their most prominent legends told of a battle that occurred in the hills around Spotted Lake—then known as Khiluk to the First Nations of the region. There are high concentrations of 11 different minerals, including calcium and magnesium sulfate, and some trace amounts of titanium and silver. 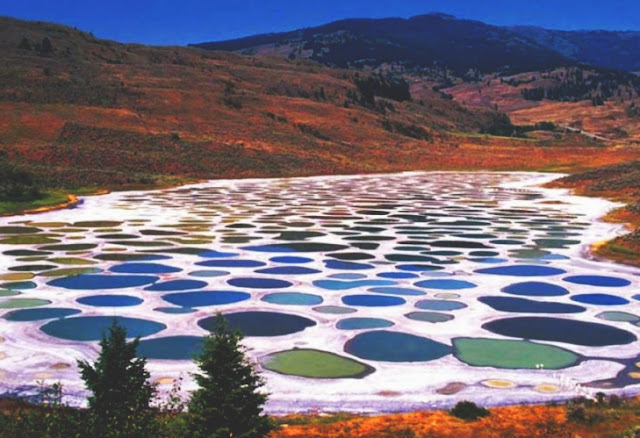 In the summer, when the lake partially evaporates, the minerals precipitate into rounded “holes.” Each hole takes on a different color, depending on which minerals are more concentrated in that particular spot. 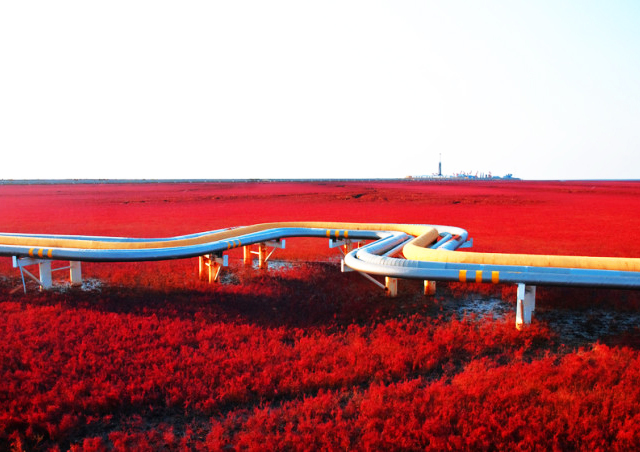 This gorgeous crimson landscape is located in China, near the city of Panjin. It’s situated in the middle of an immense, sprawling wetland area in the Liaohe River Delta, but it’s the only part of the wetland that takes on this vibrant coloration. Rather than sand, the beach is covered with a highly alkaline soil, which is too basic for most plants to live on. That leaves little competition for the Suaeda salsa, a species of seaweed that has completely taken over the 1.4 million acres that make up Red Beach. In the summer, the seaweed is a dark green color—pretty but not exactly breathtaking. But in autumn, the mature plants take on a fiery red color that turns the beach into a one-of-a-kind spectacle. Most of the beach is closed to visitors in an effort to protect the delicate ecosystem, but there’s a small section that’s open to tourists. 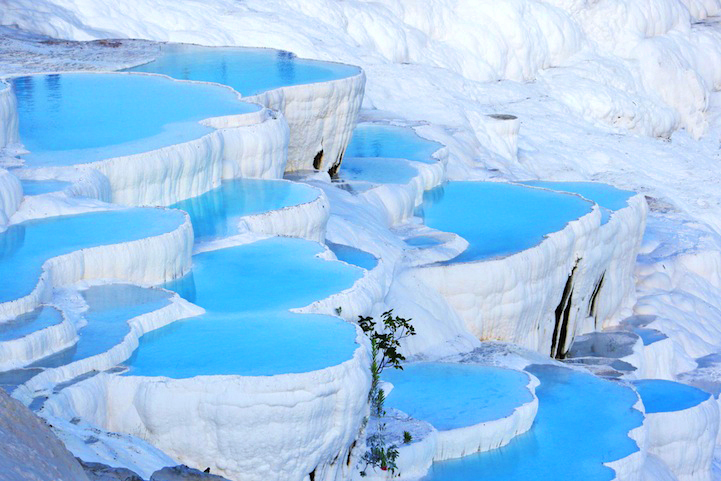 One of the most unique sights in the world is, without a doubt, the cliffside travertine pools in Pamukkale, Turkey. Travertine is a type of limestone that’s found in a lot of the world’s hot springs. When the spring reaches the surface, the travertine solidifies into stepped structures that hold the spring water. The pools are initially formed from soft calcium carbonate that later solidifies into travertine. Because of the high calcium content, the end result is a hillside that’s white as snow. The Zhangye Danxia Landform Geological Park is located in southwest China and contains more than a few unusual features. 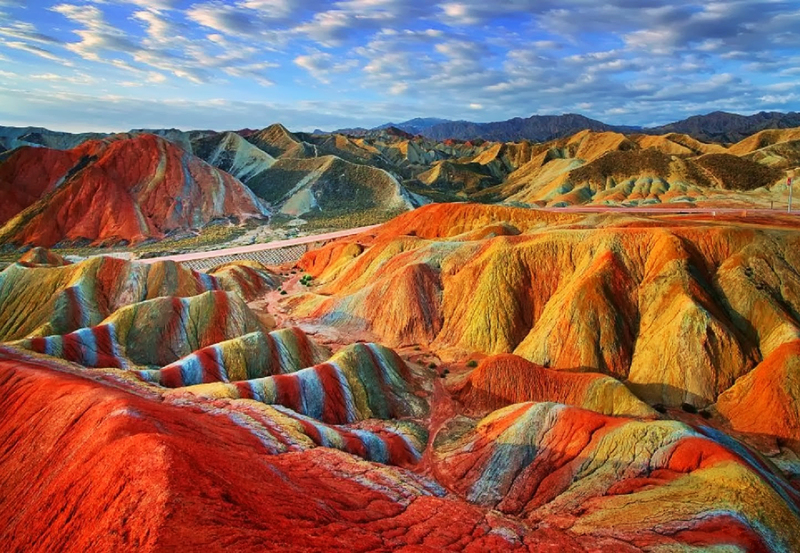 Probably the most startling are the multicolored mountains known as Danxia landforms. The surreal coloration comes from red sandstone and natural mineral deposits that have formed over the course of 24 million years. Each “stripe” constitutes a different mineral, and over the ages, they’ve formed layer upon layer, resulting in a rainbow pattern. Erosion from wind and rain has further polished the surfaces of the mountains. China is the only place in the world with this type of mineral formation, and a few of the landforms have become UNESCO World Heritage Sites. An oasis in the middle of the desert makes a pretty picture, but they’re few and far between in most of the world’s arid regions. 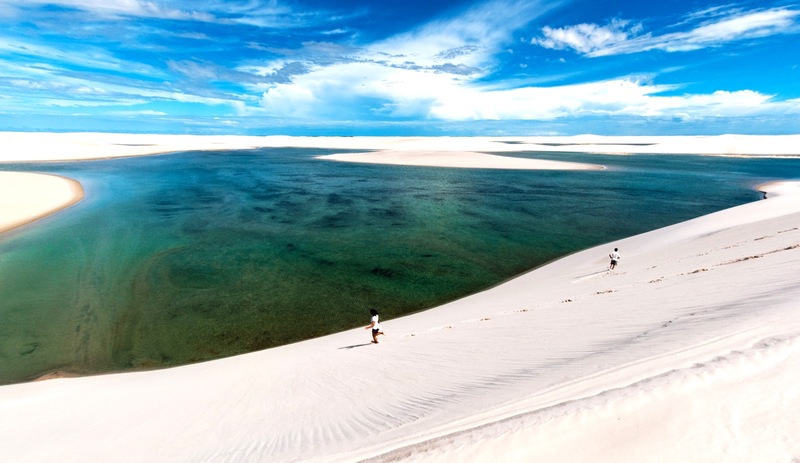 Lencois Maranhenses National Park, on the other hand, is absolutely peppered with them. Located in northeastern Brazil, this sand-covered, 155,000-acre park isn’t actually a desert, even though it looks like one. When the rainwater collects between the dunes, it forms thousands upon thousands of separate lagoons that stretch as far as the eye can see. Each lagoon functions as a completely unique ecosystem. Despite the lack of inlets or outlets, many of the standalone lagoons are filled with fish that were carried to the pools as eggs by seabirds.